Some of my work will be on display November 19th at Canned Beatz Art Space for Milwaukee’s Third Ward Gallery Night and Day. As an advocate and leader in the exhibition and promotion of Wisconsin artists, CannedBeatz Art Space is pleased to announce that they have the honor of recognizing two extraordinary artists during the upcoming Historic Third Ward’s October Gallery Night/Day on Friday, October 19, 2018. 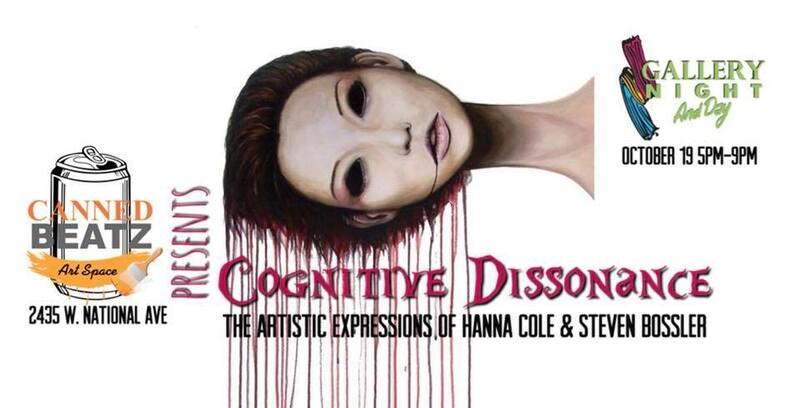 Hanna Cole (Madison, WI) and Steven Bossler (Sheboygan, WI) will be unveiling their most recent works in a reverberating exhibition entitled "Cognitive Dissonance”. The press and public are invited to view the artwork, enjoy music, and meet the artists between 5:00pm and 9:00pm on October 19, 2018 at CannedBeatz Art Space - 2435 W. National Ave Milwaukee, WI. Psychologist Lance Festinger describes "Cognitive Dissonance" as a mental discomfort experienced by holding contradictory beliefs, ideas, or values. This exhibition is a juxtaposed representation of two artists’ creations, paired together to transport the viewer out of their comfort zone and provoke a new pattern of thought. Both native to Wisconsin, Steven Bossler received his B.A. in illustration from MIAD in 2006 while Hanna Cole is currently pursuing her BFA with an emphasis in sculpture and glasswork from UW-Madison. These two accredited artists also share a passion for using their art to open eyes and imaginations while creating the desire to question simple behaviors and personal opinions. This exhibition, representing cognitive dissonance, presents with the suggested understanding that we all have an inner drive to hold our opinions, attitudes and behaviors in harmony in order to avoid tension, discomfort and cacophony. However, the inconsistency, or dissonance, which is often observed between attitudes and behaviors forces the need for a change in our thought pattern in order to eliminate the conflict, or dissonance. Through the artistic expressions of Hanna Cole and Steven Bossler, this show will open the door for that change by provoking thoughts that move the mind in diverging directions, aiming to lead the viewer to novel ideas and solutions. CannedBeatz Art Space is pleased to be the first alternative gallery in the Milwaukee area to feature the artwork of Hannah Cole and Steven Bossler. Working on new things for an uncoming show at Rogues Gallery in Milwaukee. More updates and sneek peeks to come..